AC Taxis is based in the Essex seaside town of Southend-on-Sea, where we have been providing fast, reliable coverage for over fifty years. We are by far the biggest taxi fleet for miles, with approximately 250 fully licensed vehicles and 400 drivers, all of whom are licensed by Southend Borough Council and have had the enhanced CRB check. Our reputable and safe service has contributed to Southend being awarded the Purple Flag award for its night life four years in a row, so you know you can travel with confidence. Operating 24/7, 365 days a year, our standard wait time is between five and ten minutes for a regular taxi, so if you’re looking to get somewhere fast, you know who to call. We pride ourselves on our customer service, and whether you’re going to a wedding or travelling to Gatwick Airport, we will go above and beyond to ensure we get you there on time. We are one of the most well established firms in the area, and are proud to have enjoyed long working relationships with large institutions such as Southend Council, Southend University Hospital and Social Services. Our fully staffed Call Centre in Southchurch is open twenty four hours a day, so one of our experienced telephonists will always be on hand to take your booking or answer any queries. Please don’t hesitate to ask us for any quotations not listed on the website; we’ll always be happy to help. We will also do our best to accommodate any special requests, so if you need a driver with a credit card machine or a roomy boot for luggage, let us know. As a forward thinking company, we pride ourselves on using Cordic, the most modern and intuitive dispatch system available. The system gives us the ability to fully track our taxis, record all of our phone calls and ensure wait times are kept to an absolute minimum, so you can get from A to B as smoothly as possible. 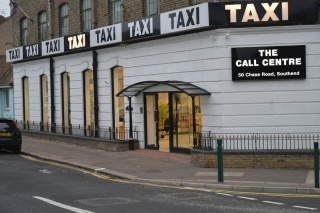 Our IVR (Interactive Voice Response) function means that ordering a taxi is now easier than ever. Compatible with landlines and mobiles, our automated system will offer you a choice of pick up locations based on journeys you have taken in the past. With the press of a button, one of our fully licensed taxis will be booked into the system and on its way to you – it couldn’t be easier. In addition, we also have a free and easy to use app – (just search for 334455) – meaning you can book your transportation without even making a call. By combining the latest in technology with our extensive history in the business, we feel AC Taxis provides an unparalleled level of service, making your taxi experience more user-friendly and efficient than ever before.